A-10s have been rotating through Europe as part of Operation Atlantic Resolve, making stops in Eastern Europe to train with and reassure our NATO allies of our commitment to their defense and to deter potential Russian aggression. 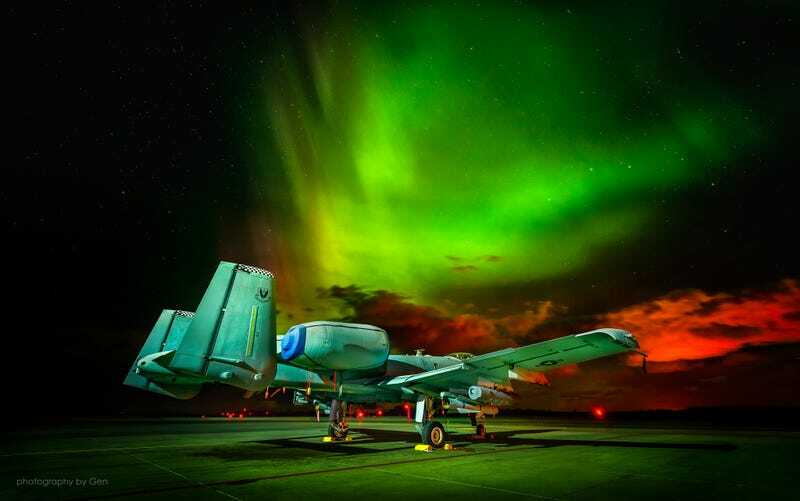 Photographer Gen Vagula took advantage of the A-10s presence at Amari Air Base in Estonia, along with some spectacular atmospheric conditions, to bring us these amazing photos. Currently there are 12 A-10 Warthogs deployed from the 23rd Wing at Moody Air Force Base in Georgia to Europe where they will remain for the coming months. These incredible shots, taken of the 23rd Wing’s ‘Hogs, were taken just two days ago. With the A-10 providing much of the USAF’s ground attack portion of aircraft rotations through Europe, it is crazy to think the USAF and the Obama Administration still want them retired so badly. Keep in mind, the retirement of the A-10 will mean that well over 250 tactical jets will be cut from the USAF’s inventory without replacement. This is not a good thing considering the USAF is just a shadow of what it was size-wise just a decade ago and is struggling to keep up with world-wide commitments as it is. At What Point Does The USAF&apos;s War Against The A-10 Become Sabotage? Make sure to like Gen Vagula’s Facebook page for more amazing photography, and check out his portfolio site here where you can order these awesome photos and others for your walls.